Emma had an idea of what she wanted for her wedding day stationery. 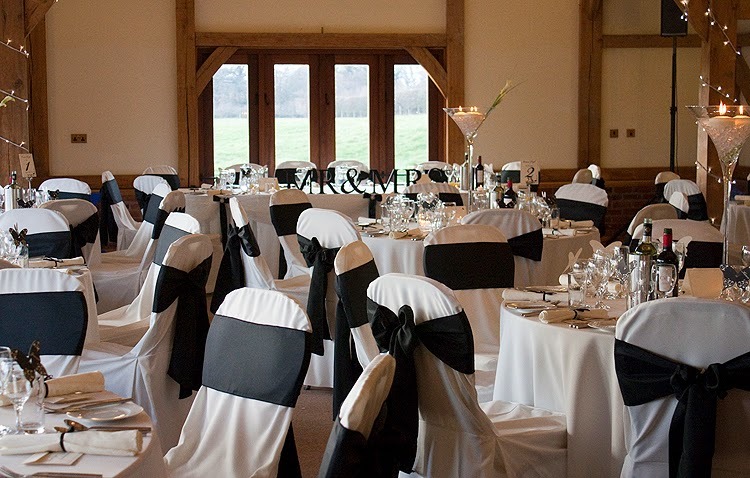 The overall colour scheme was to be ivory and black. She had browsed the internet for ideas and had already purchased a bunting type banner to display on the front of the sweets table. This had script style text and a black butterfly decoration. She had also seen butterfly place names that sit on your wine glass, and particularly wanted something on these lines. 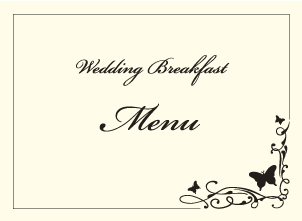 With this information, I went away and designed some ceremony seating cards. This would give an initial idea of a motif and script text that we could use throughout the rest of the stationery. 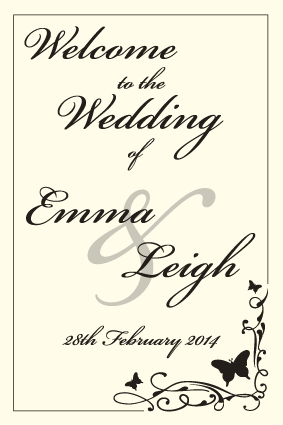 As well as ceremony seating cards, Emma wanted something to give her guests an idea of what will happen and when throughout the day. 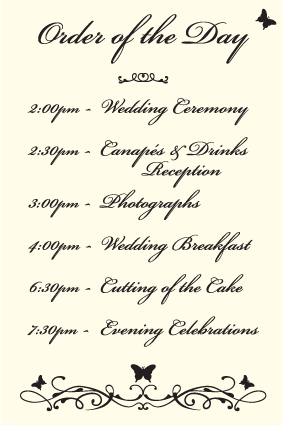 This was a civil ceremony, taking place at the venue where the wedding reception and evening celebration was being held, so an 'order of service' didn't really fit the bill. I then came up with the idea of a welcome card. A postcard size card with a front and back. Something for the guests to read as they take their seat ready for the ceremony. These worked well, and the guests liked them, not only for their information, but for their size as a lovely keepsake of the day. Next we worked on how to present the tables for the wedding breakfast. 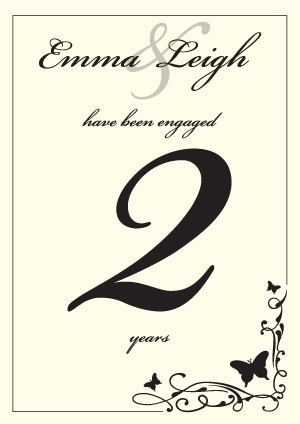 Emma had decided to use numbers for each table but wanted them to be incorporated with a fact about the happy couple. 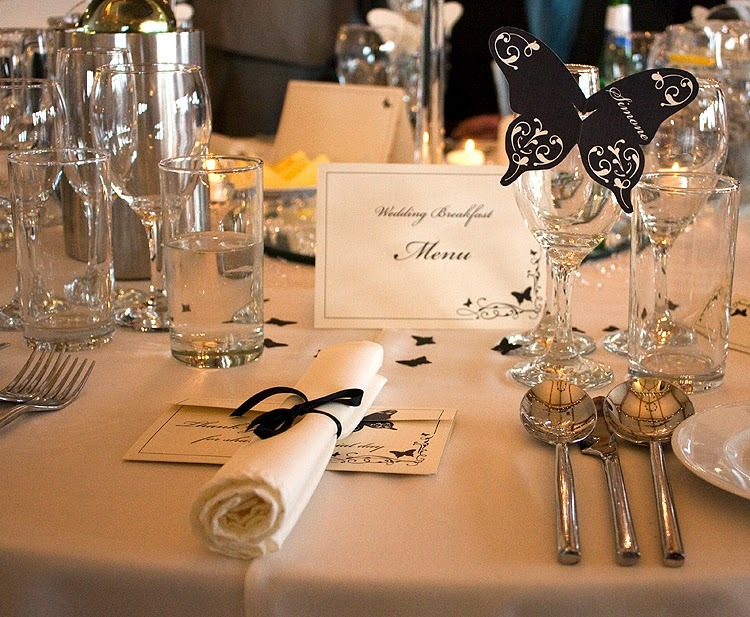 We also needed a table plan, so that the guests knew which table to sit at. Again, Emma wanted something a bit different to the norm. We finally hit on the idea of using one of those multi-framed photo display picture frames, that you would hang on the wall to display several photos at once. Instead of photos in each frame, we put the table number and the names. We were both very pleased at how this looked and displayed. 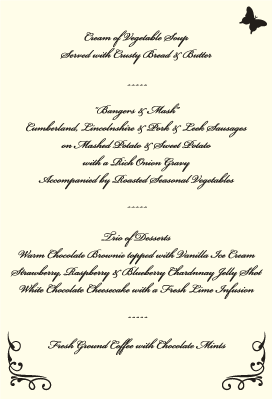 For each table we put a copy of the menu for the guests to see. This was a folded A4 card which opened up to display the full menu using the whole of the A4 size inside. 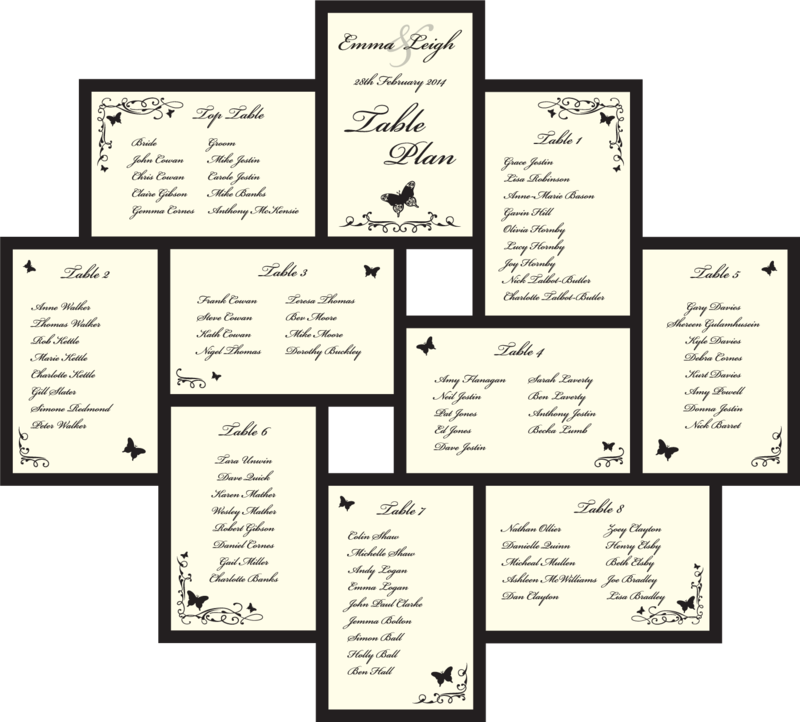 For each place setting, I designed a butterfly shape that could be cut by hand using scissors, (as I do not own a die-cutting machine, yet!) and added some graphics as well as the name. A small nik is made in the body of the butterfly so that it can be lodged onto a wine glass. As well as some black butterfly table confetti, the only other extra, that I designed, was a folder to hold a lottery scratch card. These were the favours for each guest, and can be seen under the napkin in the photo below. The whole room looked amazing. Being a guest at the wedding, I had a fantastic day and it was lovely to receive such wonderful compliments on the stationery that I had done. It gave me immense satisfaction and it felt such a privilege to have been involved in someones special day doing something that I love.